The Austrian composer died at 31 but was extremely prolific during his lifetime. His output consists of over 600 secular vocal works (mainly Lieder), 7 complete symphonies, sacred music, operas, incidental music and a large body of chamber and piano music. Appreciation of his music while he was alive was limited to a relatively small circle of admirers in Vienna, but interest in his work increased significantly in the decades following his death. Mendelssohn, Schumann, Liszt, Brahms and other 19th-century composers discovered and championed his works. 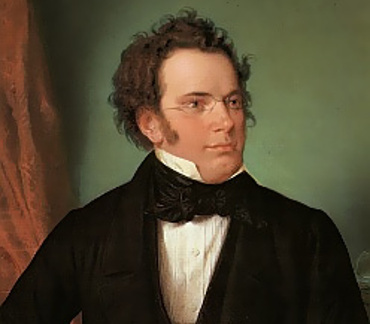 Today, Schubert is ranked among the greatest composers of the late Classical era and early Romantic era and is one of the most frequently performed composers of the early nineteenth century. Austrian composer (1797-1828). Autograph manuscript of the two songs „Minnelied“ D. 429 („Holder klingt der Vogelsang“), and „Die frühe Liebe," D.430 („Schon im bunten Knabenkleide"), unsigned. [Vienna], May 1816. 2 pages, large 4to 12-stave paper. 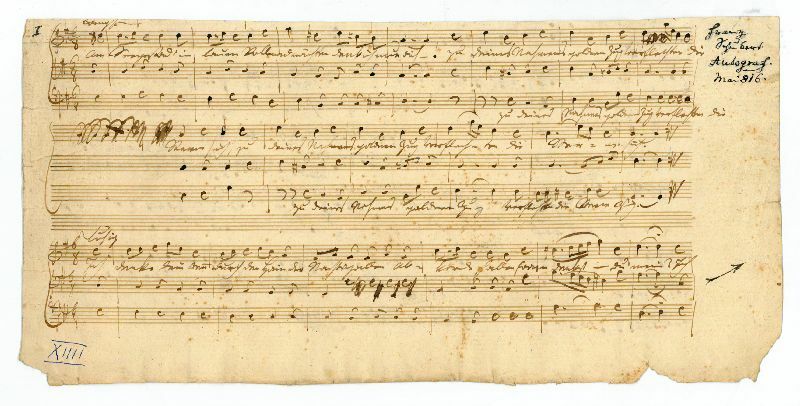 A working manuscript, „Minnelied" notated in brown ink on four and five systems per page, of three staves each, „Die frühe Liebe" on two-stave systems, extended into the margin by the composer, with autograph corrections and alterations to the music and to the words, with the three remaining verses of the second song written out by the composer beneath the staves; being the complete first drafts of the settings of two poems by Ludwig Christoph Heinrich Hölty, inscribed by the publisher C.A. Spina at the head of each song („nicht gest[ochen]" and numbered in red crayon by Anton Diabelli, with extensive musicological notes by the scholar Johannes Wolf, in a blue cloth folder.Minor tears, slightly affecting the text in the margins; a few marks and stains. These songs were first published in the old "Complete Edition" of Schubert's works in 1885. The present leaf (the two pages numbered "36" and "37" by Wolf), originally formed the beginning of a longer manuscript containing the songs „Seligkeit," „Blumenlied," „Klage," „Der Leidende," and a Canon, D. 371 and 431-433, which sold at Sotheby's, London, on Dec. 6, 1991, lot 20..
Komponist (1797-1828). Autogr. musical manuscript (beginning of "Erinnerungen", D. 424, and "Andenken", D. 423), identified in the margin by Albert Stadler: "Franz Schubert Autograf Mai 816". [Wien]. 2 SS. (303:146 and 302:114 mm). Gerahmt und verglast. 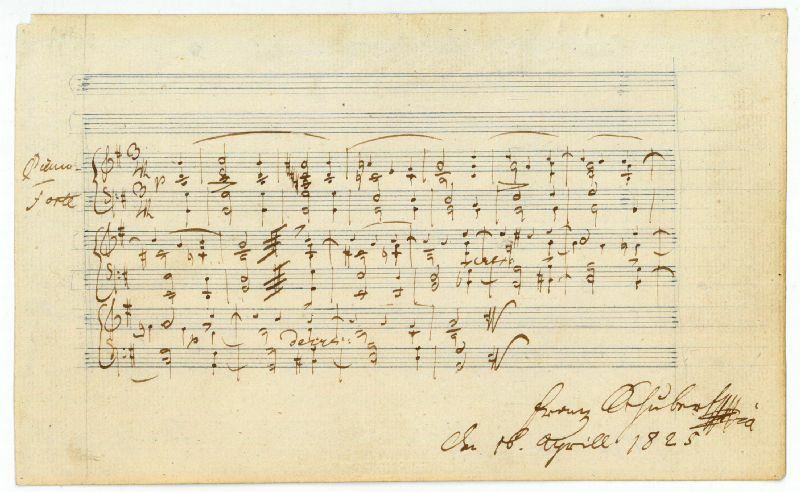 Two autograph Schubert trios after poems by Friedrich Matthisson, penned as a 19-year-old during a visit to his friends Albert Stadler and Joseph von Spaun at the Imperial seminary, which the young composer had quit in 1813. Stadler recounts these get-togethers, frowned upon by the seminary's headmasters: "Spaun would provide him with music paper, and the creative pen did not rest [...] On Sundays we had to attend the afternoon church services in nearby University Street, which always lasted the better part of an hour. Whenever Schubert visited, we would lock him in our study chamber for this period, hand him a few scraps of music paper and any old volume of poems that presented itself, that he might while away the time. Upon our return from mass we would usually find something finished, which he generously left me. I still own several such small compositions in their original autographs: [...] for three voices, [...] 'Am Seegestad' in lauen Vollmondnächten' [and] 'Ich denke dein, wenn durch den Hain' [...]" (Deutsch, Drei neue Matthison-Terzette, p. 56). Schubert had composed both melodies for a single voice as early as 1814 (D. 98/99). Both sheets, numbered "I" and "II" in Roman numerals at upper left, probably once formed the lower and upper parts of larger folio sheets trimmed above and below the present music. An arrow pointing to the upper right, added by a slightly later hand, links the two leaves among which the song "Andenken" is split. Contents in detail: leaf 1) beginning of a string quartet by Albert Stadler (D. app. I, 4); verso "Erinnerungen" (D. 424); "Andenken" (D. 423) bars 1-6. 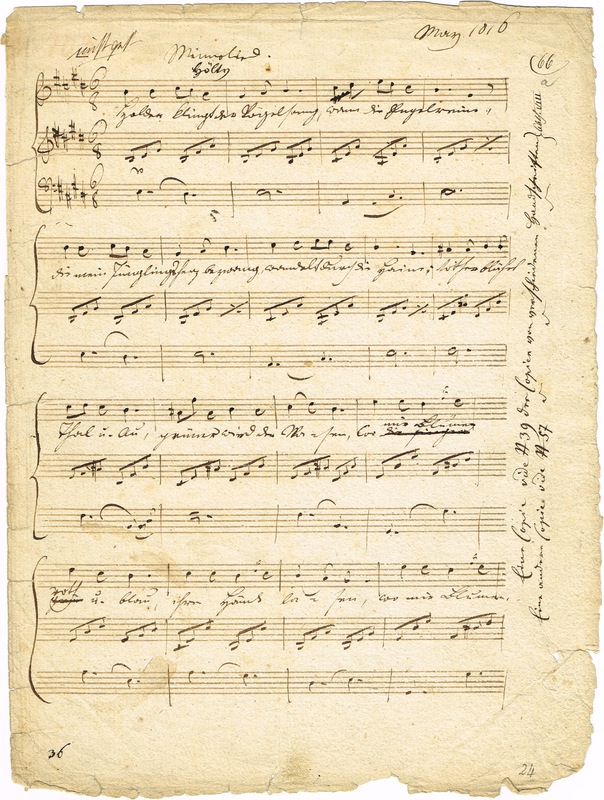 Leaf 2) continuation: bar 7-end; a few stricken musical sketches in pencil; a few indistinct pencil notes and the word "Autographe" in Stadler's hand on verso. 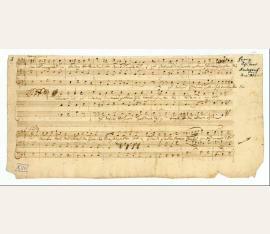 Provenance: in the collection of Auguste Loderer, Frankenburg (Upper Austria) in 1978..
composer (1797-1828). [Waltz in G major, D. 844]. 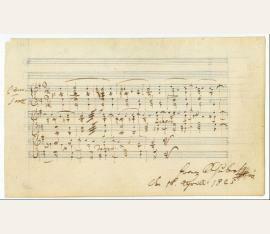 Autograph musical manuscript signed ("Franz Schubert mpria"). No place. 1 p. Oblong 8vo (108 x 181 mm). The complete Waltz in G Major for piano (D. 844, "Albumblatt"): 17 bars for piano, written in the album of Miss Anna Hönig, later Mrs. Mayerhofer von Grünbühel (in which same album the painter Moritz von Schwind, Schubert’s friend, penned another piece on 7 August 1827). - In pristine condition; accompanied by a fine engraving of the composer. Provenance: Xaver Mayerhofer von Grünbühel, Völkermarkt (Carinthia); Colonel Hauger, Grünbühel; later in the collection of Gustav Mahler, who presented it to Rudolf F.
Kallir. While the present original was considered lost by Deutsch, a photocopy is kept at the SPK Berlin (N. Mus. Nachl. 10,126. Brown, Ms. 57), and the Nachlass of Ludwig von Köchel is known to have contained a now-lost manuscript copy which at one time was kept in the archive of the Gesellschaft der Musikfreude, Vienna. 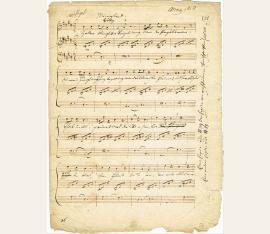 - While autograph manuscript music by Schubert taken from the composer's sketchbooks does occasionally appear at auction, complete compositions signed in full are virtually non-existent. - Includes etched portrait signed (ca. 15 x 19 cm) by the Dresden engraver Waldemar Pech (b. 1911)..